Produces good results in moderate to severe cases. Compound naturally present in the skin. The therapeutic potential of fumaric acid supplementation was first mooted several decades ago. At the end of the 1950s, a German biochemist suggested that deficiency in fumaric acid played a role in the chronic skin disease psoriasis. In the 1980s, a German doctor proved this hypothesis and developed an oral treatment for psoriasis from fumaric acid derivatives. For over 30 years, oral use of fumaric acid and its derivatives has continued to demonstrate beneficial effects in calming the itching, desquamation and discomfort characteristic of psoriasis. Psoriasis is a chronic disease of the skin which remains poorly understood. According to current scientific data, the development of psoriasis may be due to genetic predisposition, but is also triggered by environmental factors such as stress, emotional shock, use of certain drugs, hormone imbalances and certain infections. Particularly prevalent in industrialised countries, this skin disease develops in cycles. During attacks, thick, red, dry and itchy patches of skin appear on the body. Though psoriasis is a benign disease, it is nonetheless extremely troublesome and unpleasant. Hence the urgency with which scientists are researching an effective and long-lasting treatment. A little-known molecule, fumaric acid is naturally present in all living organisms. In humans, it is produced in the skin by a mechanism similar to that of vitamin D. Like vitamin D, fumaric acid is produced on exposure to the sun but in psoriasis sufferers, this endogenous production is impaired. Fumaric acid supplementation was thus first studied with a view to correcting this deficiency. Researchers investigating the effects of such supplementation subsequently found that fumaric acid did indeed offer benefits in the treatment of psoriasis. 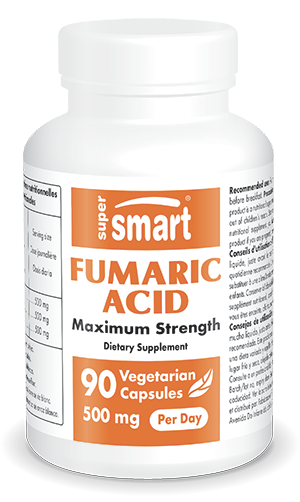 A number of studies suggest that fumaric acid’s benefits are due to its immune-regulating properties. It seems to combat certain immune system disorders including those involved in the onset of psoriasis. It may, in particular, reduce the chronic inflammation and abnormal renewal of keratinocyte epidermal cells typical of the disease. In countering these two mechanisms, fumaric acid thus appears to constitute a significant aid to treating psoriasis. Fumaric acid supplementation has been successfully used for several decades in Europe and the US. Its safety has been evaluated and confirmed by the US public health body, the Food and Drug Administration (FDA) which has added fumaric acid to its list of GRAS (Generally Recognized As Safe) substances. Only one, harmless side-effect has been reported – a ‘flush’ – a sudden, temporary redness on the face. Current evidence thus suggests that those suffering from psoriasis can use fumaric acid in complete safety. Take one vegetarian capsule a day with plenty of fluid, just before breakfast, or as advised by your therapist.